Use drag-and-drop popup builder to customize popup that feels like it was build just for your WordPress site. Add custom images, buttons, text and more—create the popup you want with no limits. Popup Builder gives you total control of the settings, so you can completely match your popup to the design of site. Our Popup Plugin by Supsystic provides you with an ability to customize your pop-up from head to toe. So, what are the main points in popup customization? Popup by Supsystic allows you to create your own unique design of popup window without any programming skills. You can change the background of a popup, an appearance of markers and close button, select font type and size, and set other popup attributes, which may vary depending on the selected template. Check the full list of settings in article Popup Appearance Settings. Choose animation effect for your Popup from the list of available choices. You can find a detailed description of all the effects by following the article Popup Animations. Layered Popup Style allows you to set popup in any place on your page – top, bottom, left, right, center, on any corner of the page. You can see examples and check details in the doc Popup Location. 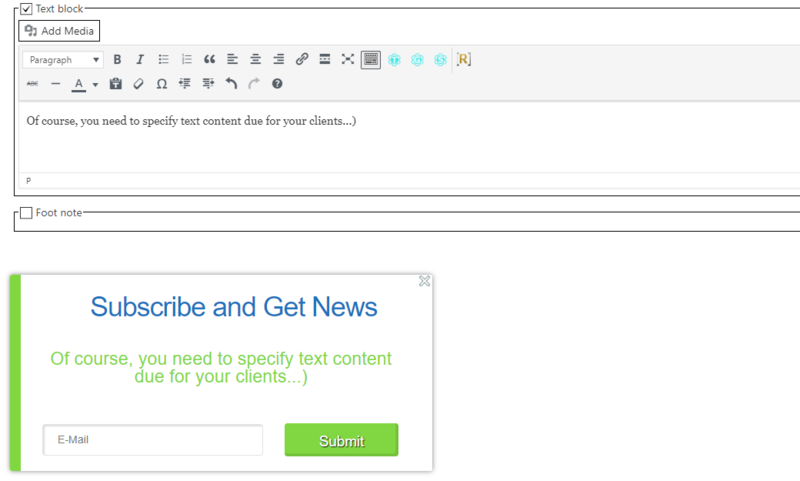 Of course, you need to specify text content due for your clients, so, we have comfortable user-friendly interface to make it easy for every user. As an important tool for promotion, Social Share buttons for pop up are also customized. By following the link to the article Social Share you can find more information on this topic.